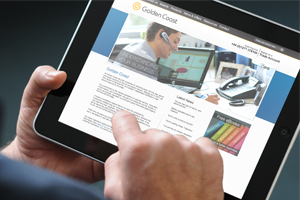 Golden Coast / News & Offers / Sales & Marketing / Blog / The importance of a mobile-friendly website. How people use the Internet is changing. The PC used to be king, and then along came the laptop but essentially both accessed the Internet in the same way; via the phone system. And then the phone system changed. Way back in 2011 mobile phone calls overtook landline calls for the first time and in the same year it was reported that there were more mobile phones in the UK than people. And the revolution didn’t stop there. Early in 2013, worldwide sales of smartphones exceeded those of feature phones and by mid 2013, 90% of global handset sales are accounted for by iPhones and Android devices. So the mobile web is big business. Tablet or phone, what’s the difference? Of course, there are other ways to access the Internet and the wet leisure industry from a mobile device other than by using a smartphone. iPads and tablets have become hugely popular and they form a third way of people to use your website. Tablets fall half way between a smartphone and a traditional computer for a number of reasons but have their own peculiarities that you need to be aware of. Tablets are essentially touchscreen devices, as smartphones are, and that can cause problems with the navigation on your site. For instance, on a traditional website it is quite common to hover over a navigation tab in order to see a dropdown menu. But how do you hover, with a touchscreen? Quite simply, you can’t. A tablet might be connecting to the Internet via wireless or using a 3G connection. In both cases, your customers might find large image files frustrating to download and, if they are using 3G and paying by the Mb, they might object to the cost incurred. Where a tablet does become closer to a laptop is in terms of screen size, but don’t forget that people like to use their iPads and tablets in either landscape or portrait format and will expect your site to be able to smoothly change between the two. How to look smart on a smartphone. There are a million statistics out there, but it’s safe to assume that somewhere between 30% and 50% of the traffic to your website is from smartphones. And that figure will increase. So your website that promotes you pool, spa and sauna business needs to look good on a smartphone, be easy to navigate and have the right sort of content. Perhaps it already has? The first thing that you should do is to use Google Analytics to look at the traffic your website has at the moment. The data will show you which visitors are using mobile devices and how long they are staying on your site. If a lot of the mobile traffic is bouncing off quickly then it’s a safe bet that your present site isn’t optimised for them. If you do need to make your website more smartphone-friendly then check to see if your existing website package offers mobile support. If it does it might be relatively straightforward to have your existing site visible to someone browsing on a laptop while a mobile user sees a stripped down version. If you decide to rebuild your website then you should make sure that your developer produces a responsive site design. Responsive design uses Cascading Style Sheets (CSS) to create a single version of the website that adjusts to display properly on all devices. It’s also worth remembering that people viewing your website on a smartphone will probably be looking for simpler information; contact details and directions to your business, some basic information of the products and services that you offer and some fairly short, sharp copy about why they should choose you.